It’s too hot to turn on the oven or even the cooktop to make dinner here. Maybe where you are, too? 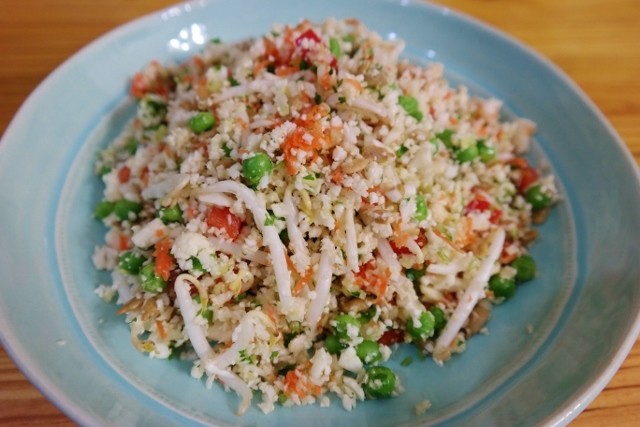 Cauliflower Fried Rice is on the menu this week. Light, quick to prepare, yet filling. 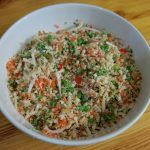 In the years since, I have modified PuraVegan’s version of Cauliflower Fried Rice to make it work for our kitchen. I’ve added more veggies and an option to spice it up a bit. I’m so excited to share it with you today because I am certain you will enjoy it, too. It’s a main dish here, but it would make a nice side dish or a salad to take to a potluck. If spice is your thing, by all means add Sriracha to the top. Or go crazy and get some Gochujang, but make sure it’s gluten-free. If you are striving to eat raw, you’ll want to use raw sunflower seeds. I like the flavor of roasted ones better. If you are eating raw, you’ll probably want to use Bragg’s aminos or coconut aminos as opposed to a gluten-free soy sauce. If you live near a Trader Joe’s, they have cut little package of fresh English peas. These are wonderful in this dish and you’ll need a couple of packages. Otherwise, any fresh or frozen peas, thawed of course, will work. I use a Cuisinart food processor to “rice” the cauliflower and have heard from others who simply use a box grater. Let me know if you try the grater method and take good care of your fingertips while doing that! In bowl of food processor fitted with an "S" blade, add 1/2 head of cauliflower, broken into smaller pieces. Pulse until it has the texture of rice. Remove from the bowl of food processor and place in a large mixing bowl. Repeat with second half of cauliflower. 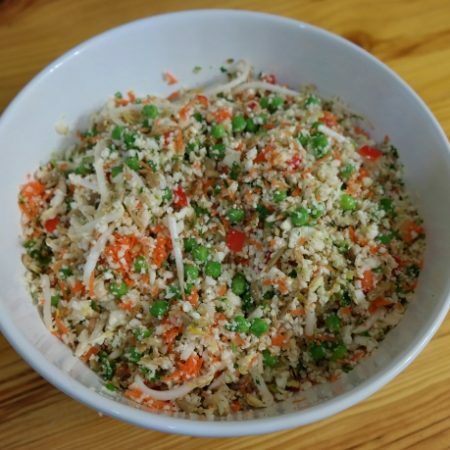 Place that cauliflower "rice" in the large mixing bowl. Add the onion, cilantro, ginger root, garlic and drizzle of oil to the bowl of the food processor. Pulse until is has the consistency of a slightly chunky sauce. Remove from the bowl and place on top of the rice. Add the red pepper, sprouts, sunflower seeds, peas and carrots. Toss to combine. 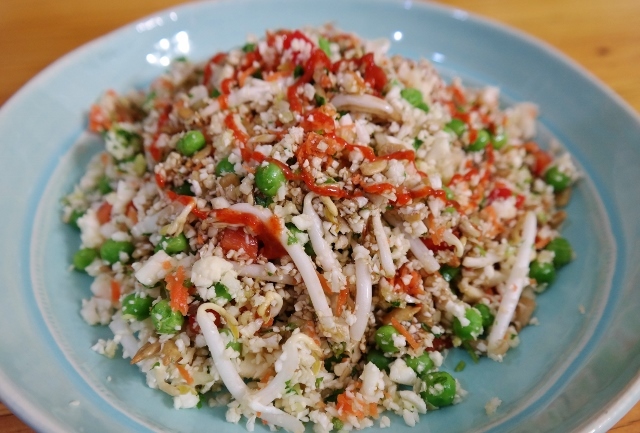 Serve with Bragg's aminos, coconut aminos or gluten-free soy sauce. Add a bit of Sriracha or gluten-free Gochujang if you like spice. Additional notes about ingredients and tools I use are included in the blog post where this recipe is featured. I encourage you to read it, as there is more information there than I can include in a recipe. Thank you! Disclosure: This post contains affiliate links. Should you follow one of them and make a purchase, I may make a small commission. I use affiliate links to offset the costs associated with maintaining this website and providing original, tested recipes and dining/travel info at no charge to you. Thank you for your support. « My Favorite Sriracha Recipes and a GIVEAWAY! One word. Delish! Okay, a little bit more. I love the addition of sunflower seeds, which I see in the directions, but don’t see in the ingredients listing. Thanks for catching that, Shirley. Updated. 1/2 to 1 cup is the answer, depending on how crunchy you like it. I go for the full cup of crunchy goodness. Oh, I’m all about the crunchy! That’s one reason I love sunflower seeds! 🙂 Thanks! This looks so delicious, I love the addition of the beansprouts, love that crunch. Thank you! I agree, bean sprouts are the perfect crunchy addition.